Enclose an open cheque payable to the Society, but limited in writing between the crossed lines to the total amount allowing £2 per book for p&p to a maximum of £6. This is in case any of the books you have ordered have been already sold and then the cheque can be made out for a smaller sum. 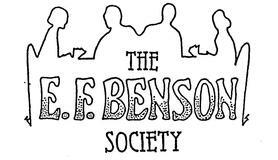 You can also use PayPal to purchase from the Society using the Society’s e-mail: info@efbensonsociety.org If you are outside the UK, do use this system, it is much easier for you. If you use this facility, please advise the Society by e-mail of your purchases, name address where they to be sent etc. so that we can satisfy your order. This list is just part of the listings. For a full list please contact the Societyand one will be sent to you.